You Will Be Jealous With These Sneakerhead’s Shoe Collections! Renowned YouTuber in the local scene, Joseph Germani is a MASSIVE sneakerhead. He even has a wall display of his shoes collection in his living room! He even curated a video of his sneaker collection here. This adorable lifestyle YouTuber might have more sneakers than you do. Check out this reaction video when Joseph surprised her with a fresh pair of Yeezys! We are totally digging Amirul’s sense of style on his social media. 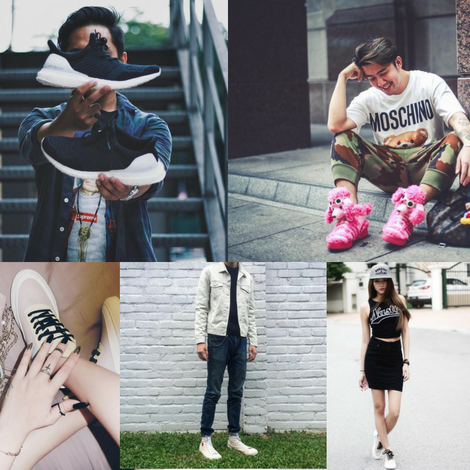 Check him out, and we could guarantee an Instagram feed could be every sneakhead’s favourite. With a balance of monochrome shades and minimalism, Shaun’s photos on Instagram is an expression of his love for shoes and anything artsy. Stephiie in streetwear = swag. Definitely lovin’ her look when she pairs a casual outfit with bold sneakers! Gino’s love of kicks is made apparent on his Instagram – gotta love the black and white theme too!